The Choptank River Light was constructed in 1870 and was a hexagonal cottage style screw pile lighthouse built by Francis A. Gibbons. The lighthouse sat at Bernoni Point in the Choptank River and replaced the Lightship Hooper Strait/Relief (LV 25) that was anchored there from 1870-1871. This lighthouse was similar in style to the York Spit Lighthouse in Virginia. The lantern contained a sixth-order Fresnel lens. In 1881 ice piled up against the lighthouse cracking some of the pilings and tilting the structure. Damage was not significant and the lens was upgraded to a fifth-order Fresnel lens. Records show that in January 1918 this lighthouse structure was destroyed by ice flows that are said to have climbed 30 feet around the lighthouse and knocked it off the pilings. The newly decommissioned Cherrystone Bar Lighthouse in Virginia was moved to the Choptank Lighthouse site and placed on top of a new screwpile foundation. The lighthouse was re-commissioned in 1921 and continued service until 1964 when the cottage was dismantled. It should be noted here that this is the only lighthouse on the Chesapeake Bay to have been replaced with an existing lighthouse from another location. No photo available for 1870 lighthouse. 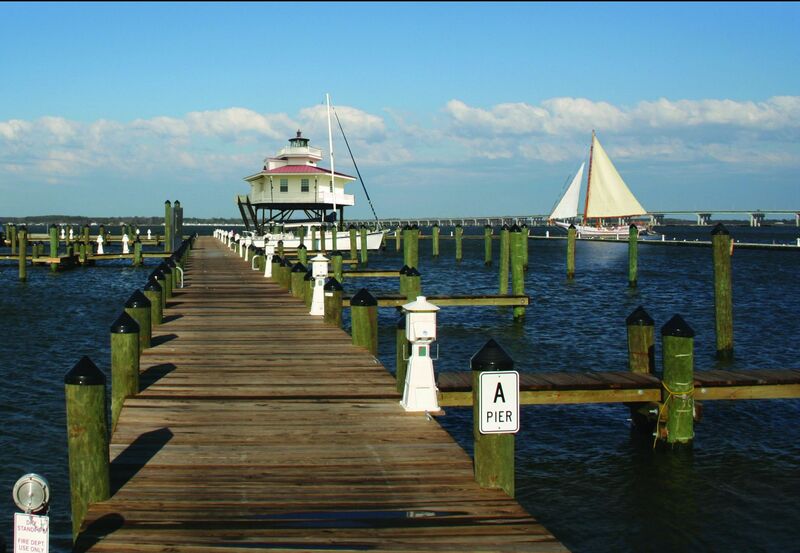 The City of Cambridge, Maryland, has approved plans to build an exact replica of the lost Choptank River Lighthouse. The replica will be at the end of Pier A in the newly expanded Cambridge Municipal Marina adjacent to historic Long Wharf Park. After many years, the Maryland Legislature passed and Governor O'Malley signed legislation allowing this over water structure. We incourage lighthouse lovers to get involved. For more information: www.choptankriverlighthouse.org..
Digital rendering of the replica Choptank River Lighthouse as it will look withing the Cambridge Municipal Marina provided by Eclectic Graphics.